Today we celebrate the 228th anniversary of the inauguration of George Washington as the first president of the United States. 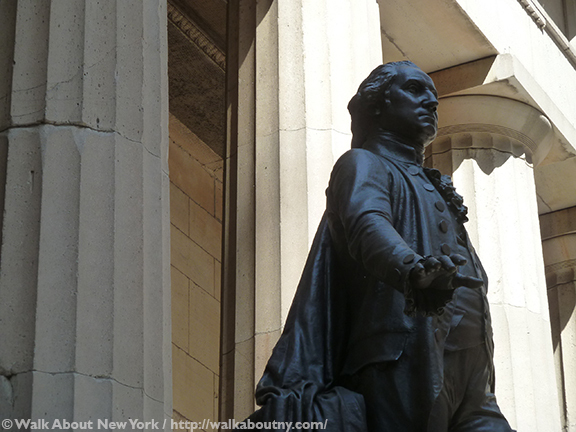 He was sworn in on April 30th 1789 at Federal Hall on Wall Street. Washington was the first, but not the last president to be sworn in in New York. Chester A. Arthur took the oath of office at his home, 123 Lexington Avenue in New York when James Garfield died of his wounds from an assassin’s bullet in September of 1881. 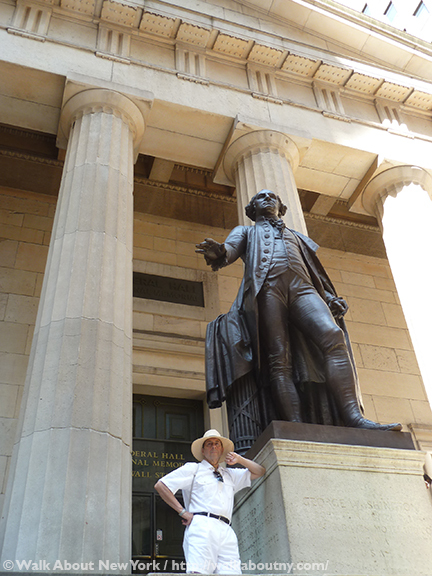 This was not same Federal Hall that we know today. The present-day National Park Memorial site dates from 1842, but standing on the same land where Washington was sworn in. Pierre L’Enfant (1754–1825) was chosen in 1788 to remodel New York’s 1701 city hall to serve as the first U.S. capitol building. President Washington would select Monsieur L’Enfant in 1790 to design the nation’s new capital, the 100-square-mile District of Columbia. I am standing with George on a summer day. John Quincy Adams Ward (1830-1910) designed the bronze, “George Washington’s Inauguration;” it is located approximately where the balcony of the new capitol would have been; that is where America’s first president was sworn in. Designed by society architect Richard Morris Hunt, a granite pedestal, rising 11.5 feet high at its front supports the 12-foot tall sculpture. How spectators may have looked up at the swearing-in ceremony. President Washington is shown extending his hand as if placing it on a Bible. The Good Book that he did use is known as the St. John Bible because it is the property of St. John’s Lodge No. 1, Ancient York Masons; it can be seen within Federal Hall. Warren G. Harding, Dwight D. Eisenhower, Jimmy Carter, and George H. W. Bush also used this Bible at their inaugurations. In addition to its duties at inaugurations, the Bible has been part of the funeral processions of George Washington and Abraham Lincoln. It was present at the centennial celebrations for the laying of the White House and the U.S. Capitol cornerstones; at the 100th anniversary of the Statue of Liberty; and displayed at New York’s 1964 World’s Fair. 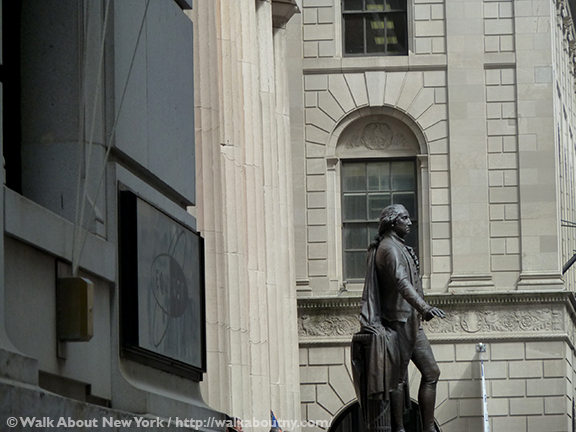 “George Washington’s Inauguration” seen from 14 Wall Street. Mr. Ward’s sculpture was dedicated on November 25th 1883. It was the centenary of the grandest public holiday celebration in New York City, Evacuation Day. That was when the British Army finally sailed from New York, two months after the Treaty of Paris, which ended hostilities between the British Crown and their former colony, was signed. General Washington marched south from Upper Manhattan and proclaimed the British evacuation on November 25th 1783 in the area of what is now Union Square. Throughout the balance of the 18th century and for all of the 19th, Evacuation Day was a bigger holiday than the Fourth of July. Several reasons led to its shrinking from American popular culture. Newer immigrants had no connection to, nor understanding of the event; Thanksgiving was declared a national holiday in 1863, eventually making it November’s big celebration; and Great Britain was an ally by the 20th century. The bluestone pavement where Washington stood when sworn-in. Early in his career John Quincy Adams Ward assisted Henry Kirke Brown sculpting “George Washington” at Union Square; it was dedicated in 1856, making it the first artwork in a New York City park. Ward was dedicated to idea that American sculptors should present American ideas and be trained in America; he never studied in Europe. He was America’s leading sculptor for fifty years, becaming known as the “Dean of American Sculpture.” Mr. Ward has four bronzes in Central Park. They include “The Indian Hunter,” 1869, which established his reputation; “William Shakespeare,” 1870; “The Puritan,” 1885; and “The Citizen Solider,” 1869. 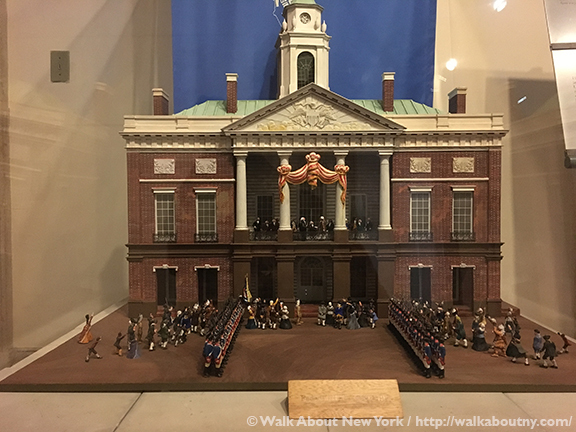 A scale model of Federal Hall when Washington was inaugurated. 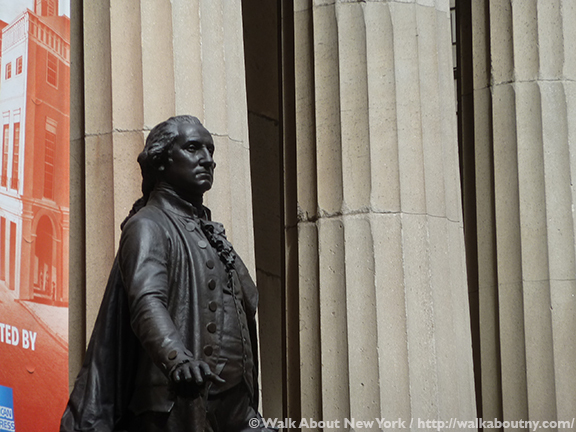 Today the National Park Service operates Federal Hall as a free museum. 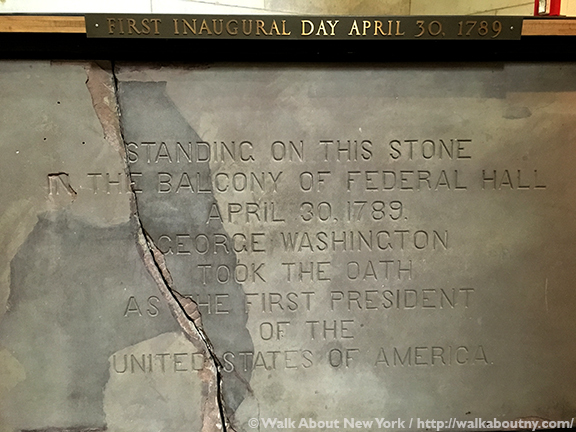 Among its exhibits are several models of how Federal Hall has changed over the years. 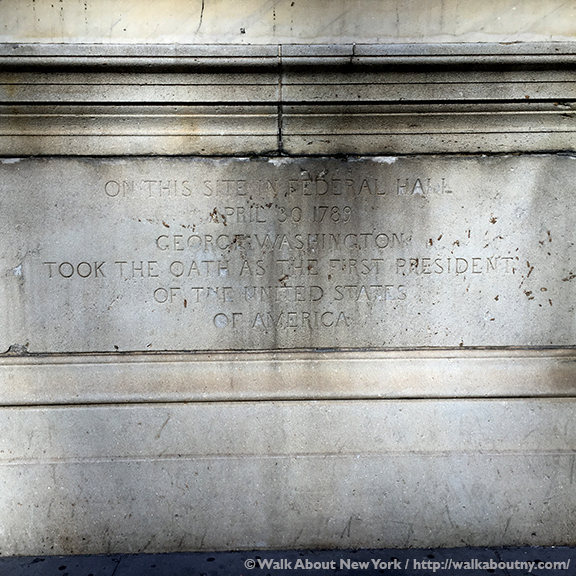 On May 26, 1939 the building was designated the Federal Hall Memorial National Historic Site; and on August 11, 1955 it was created a national memorial. 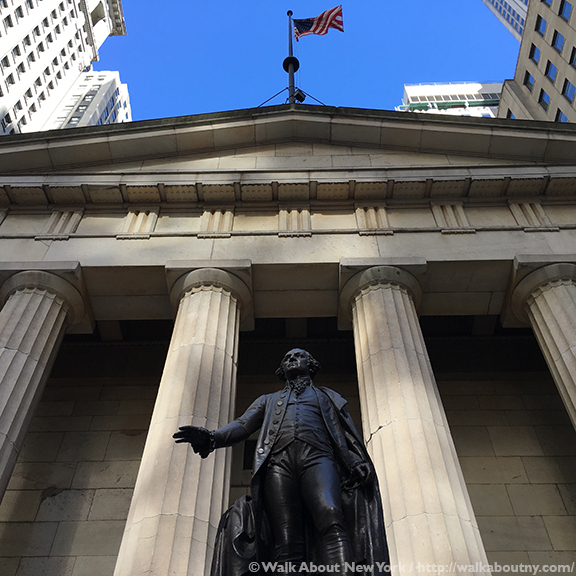 Federal Hall was designated a landmark by the New York City Landmarks Preservation Commission on December 21, 1965; and was listed on the National Register of Historic Places on October 15, 1966. “George Washington’s Inauguration” stands out against the marble columns. 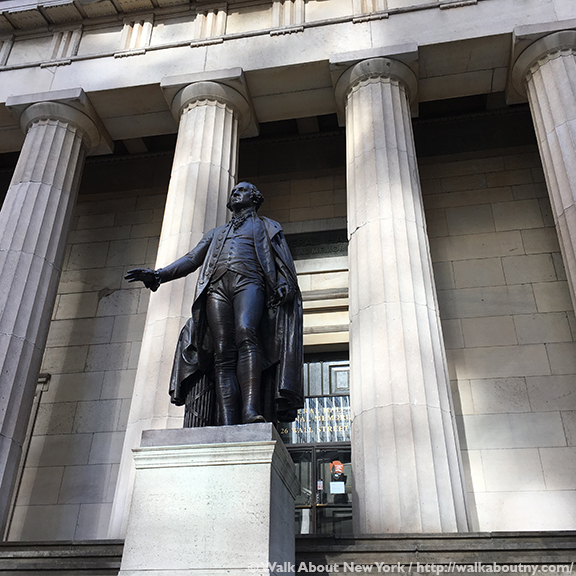 Discover the handsome Greek Revival façade of Federal Hall, its deep historic roots, and “George Washington’s Inauguration” when you are part of our Downtown Manhattan Walking Tour. You may get to see the St. John Bible, if its owner, St. John’s Lodge, is not using it. Take the Tour; Know More! 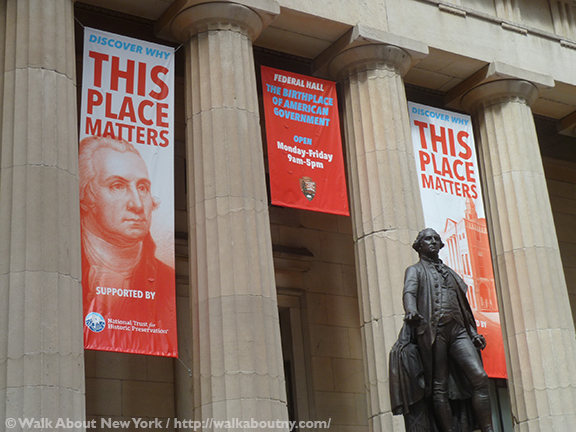 Modern advertising to attract attention to Federal Hall.